Google Maps has a great new feature that shows 3D photo tours for more than 15,000 landmarks using the images submitted by Panoramio and Picasa Web users. 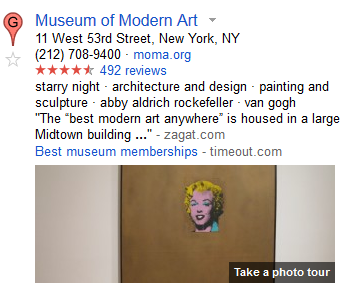 Google displays an image preview next to the local search results that have photo tours, so it's easy to find them. 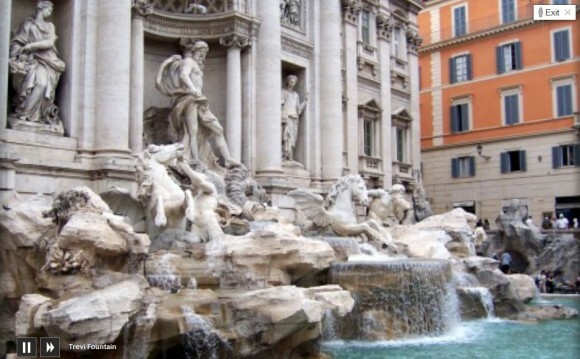 Here are some examples: La Sagrada Familia, La Tour Eiffel, Santiago Bernabéu Stadium, Hungarian State Opera House, Trevi Fountain. The feature uses WebGL, so it only works in Chrome, Firefox and Safari (where it's disabled by default). "To produce these photo tours, we use advanced computer vision techniques to create a 3D experience from public, user-contributed Picasa and Panaromio photos. We start by finding clusters of overlapping photos around major landmarks. From the photos, our system derives the 3D shape of each landmark and computes the location and orientation of each photo. Google Maps then selects a path through the best images, and adds 3D transitions to seamlessly guide you from photo to photo as if you're literally flying around the landmark and viewing it from different perspectives," explains Google. 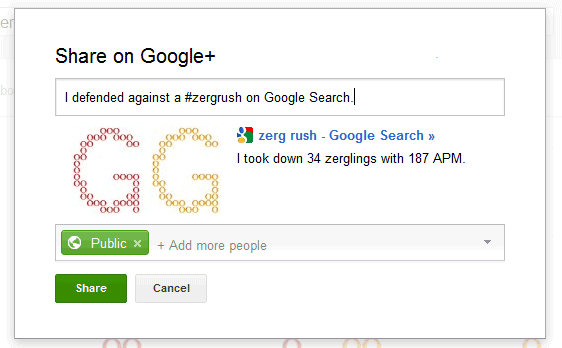 Google has a new Easter Egg: search for [zerg rush] and you'll notice that search results will start to disappear, destroyed by zerglings. Your mission is to save the search results and kill the zerglings using your clicks, but it's not easy. According to KnowYourMeme, "Zerg Rush is a popular online gaming term used to describe an overwhelming scale of attack carried out by one player against another in real time strategy (RTS) games. The term originates from the popular RTS game Starcraft, in which the Zerg race is notoriously known for its ability to mass-produce offensive units within a short time frame, thus allowing the player to overpower the opponent by sheer number." 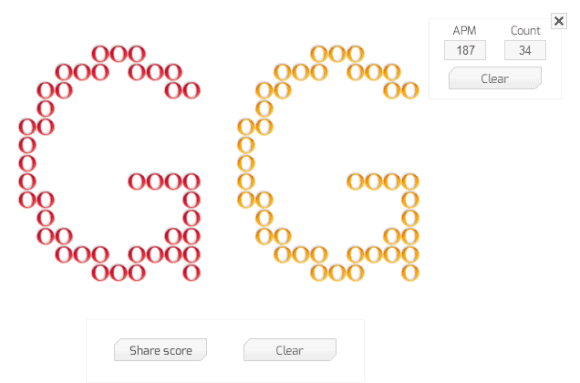 When the game is over, Google lets you post your results to Google+ and shows the message "GG", a cryptic way to say "Good Game". Google Drive has the most powerful image search technology you can find in an online storage service. It uses Google Goggles technology to recognize objects, logos, landmarks, text and much more, so you can find an image even if the filename is a.jpg. The most impressive thing is that the processing happens as soon as you upload the images and there's no setting to enable. 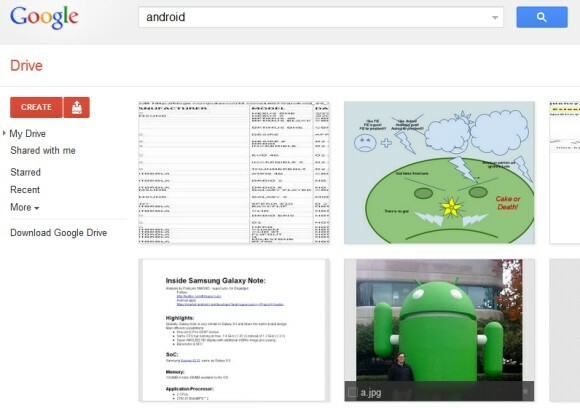 For example, Google Drive found an image of the Android statue from the Googleplex when searching for [Android]. 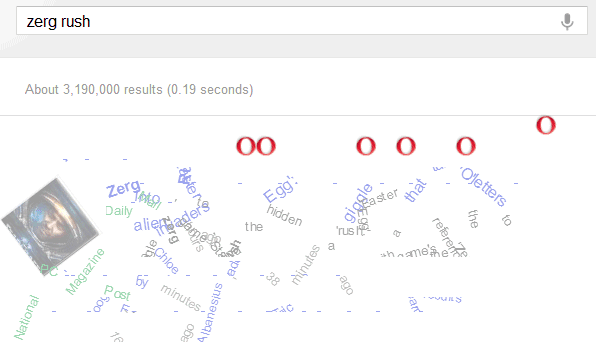 It also found a screenshot of Google's homepage and a Chrome logo when searching for [Google], this time using OCR technology. "Let's say you upload a scanned image of an old newspaper clipping. You can search for a word from the text of the actual article. We also use image recognition so that if you drag and drop photos from your Grand Canyon trip into Drive, you can later search for [grand canyon] and photos of its gorges should pop up. This technology is still in its early stages, and we expect it to get better over time," explains Google. 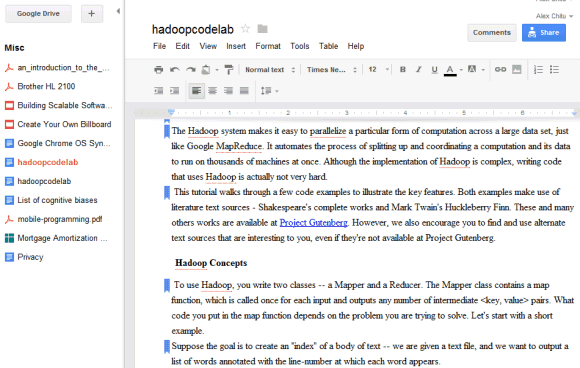 One of the most important Google Drive features is the support for third-party apps. Now you're no longer limited to Google's word processor, spreadsheet editor, presentation app and you can use web apps developed by other companies. 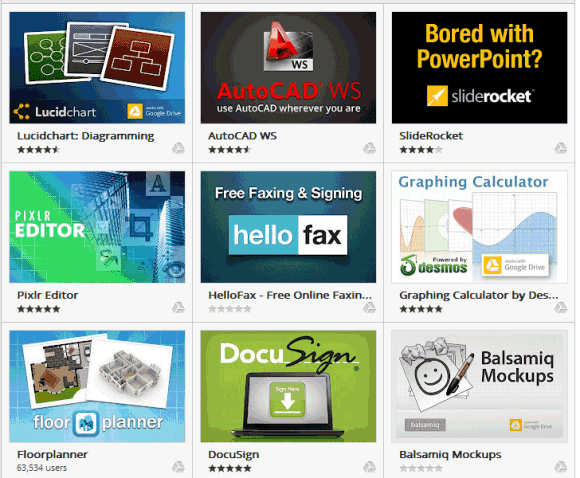 Google released a SDK for Google Drive apps and there are already 18 apps that use it. Users are required to install a Chrome app from the Chrome Web Store for each Google Drive app, but they don't have to use Chrome. Google's dev blog informs that "Drive apps are distributed from the Chrome Web Store and can be used with any modern browser." I've managed to install apps in Firefox and Opera, but not in IE9. To integrate a third-party app with Google Drive, the app sends you to a page that asks for your permission. 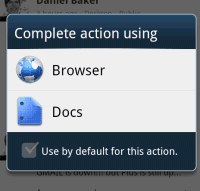 The authorization process fails if you load the page without installing the Chrome Web Store app. As Google says, "apps will not have any API access to files unless the app has been installed in Chrome Web Store." Chrome apps are only used to allow the third-party apps to use the Drive API, but they can be uninstalled immediately after they're installed and all the features will work in Chrome and any other browser. At the moment, Drive apps don't integrate with Chrome, but that's likely to happen in the future. Chromebooks would be a lot more useful if you could sync files with Google Drive and open them using web apps. 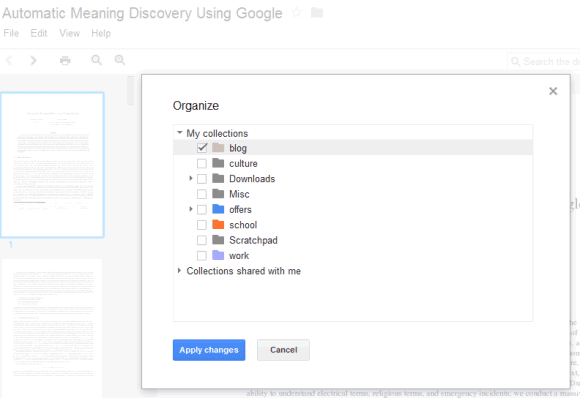 Google Drive added a new way to view the files from a folder. Just right-click the folder, select "open folder" and you'll be able to preview and edit files, while still seeing the list of files. The nice thing is that the files are cached and you can quickly switch between them without reloading the files. You can use this feature to compare documents, edit two documents simultaneously or preview the files from a folder shared with you. 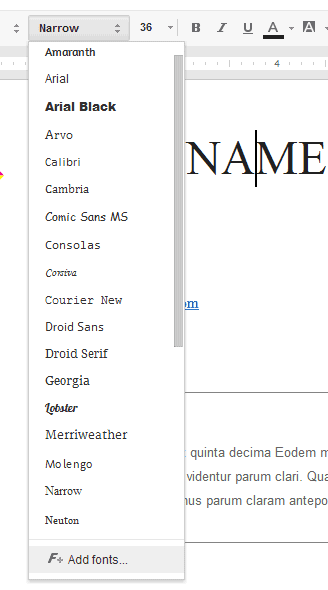 The sidebar can be minimized by clicking the small arrow icon and you'll still be able to click file icons. 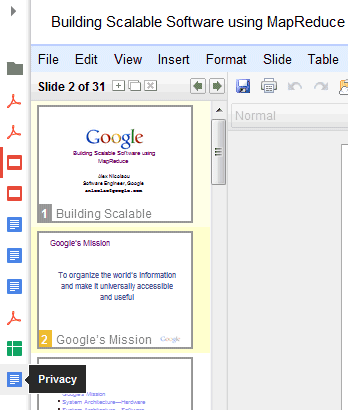 There's a really cool feature that could be available soon in Google Docs. Just press Alt+/ or click the "?" 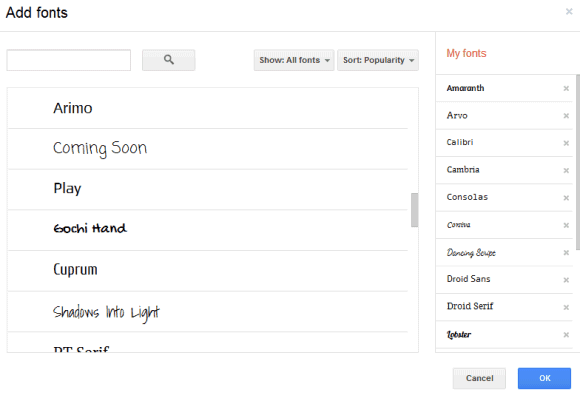 icon from the toolbar and you can type a few letter from the name of a Google Docs command and select it. For example, you can type "in" and select "increase indent" or "insert row above". It's much faster than finding the command in the Google Docs menus. You can try the new feature using this template (update: the document has been removed). 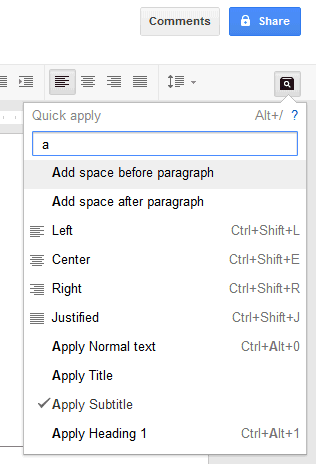 Just click "use this template" and you'll create a new document that opens in an updated version of the Google Docs editor. 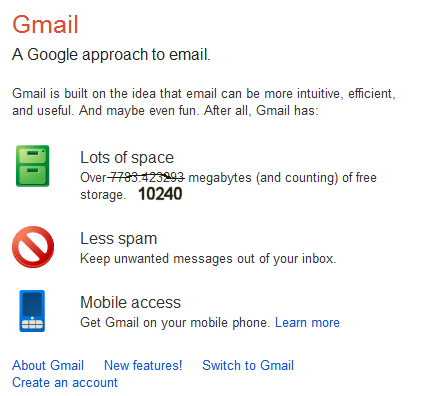 Gmail now offers 10 GB of free storage, up from 7.56 GB. Google says that "the increase will take effect over the next 24 hours" and the reason for this sudden bump is Google Drive's launch. To get more Gmail storage, check the new Google Drive plans. I find it strange that Gmail offers two times more free storage than Google's online storage service. While the files created using Google Docs apps don't count towards the free storage limit, there are many other files that can be uploaded. I also find it strange to see that Google Music can store up to 20,000 of music files for free and that's more than 80 GB of free storage. 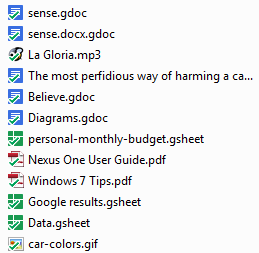 Google Drive should be the place where you can find all your files. Right now, photos and videos are stored using Picasa Web Albums, music files are stored in Google Music, documents are stored in Google Docs/Drive and many files are stored in Gmail. 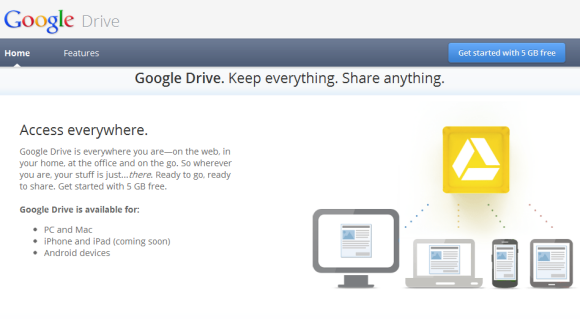 Google Drive is finally here, but it's not a completely new service. 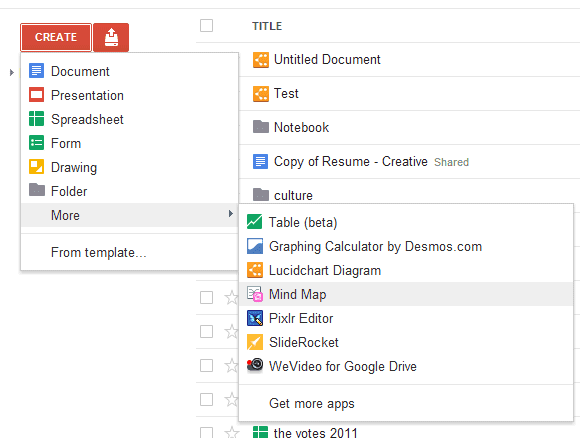 It's not just a new name for Google Docs, it also brings a different vision: your files are always in sync. Google Drive offers 5 GB of free storage, up from 1 GB, and lets you download desktop and mobile apps that synchronize your files. For now, the apps are only available for Windows, Mac and Android, but Google will release an app for iPhone and iPad in the near future. By default, the desktop app creates a new folder for Google Drive, downloads all the files uploaded to Google Docs and adds shortcuts for the files created using Google Docs apps. This way, the files download to your computer are available offline and can be opened using your favorite apps, while the files created using Google Docs can only open in a browser. If you use Chrome, you can also open some of the files offline. For some people, this will be confusing. Another issue is that Google offers some new storage plans. 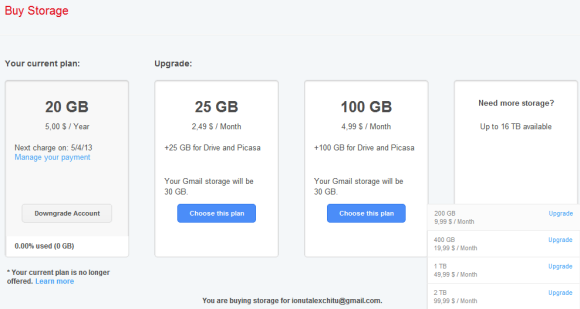 The sad thing is that Google's new storage plans are a lot more expensive that the previous ones: now you need to pay $2.49/month (almost $30/year) for 25 GB, instead of $5/year for 20 GB. They're still cheaper than Dropbox's plans, but they're more expensive than Microsoft's plans. Microsoft downgraded the free quota from 25 GB to 7 GB, but existing users can still keep it. 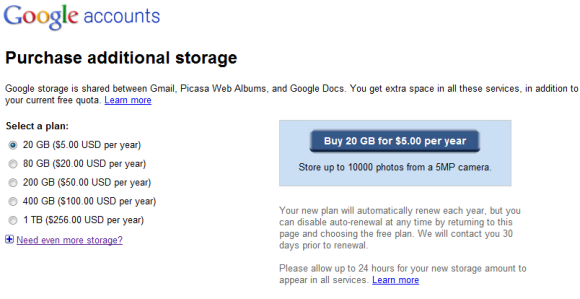 If you upgrade to one of the new plans, Google offers 30 GB of additional Gmail storage. For some reason, the shared storage is no longer available for Gmail and it's now limited to Google Drive and Picasa Web Albums. 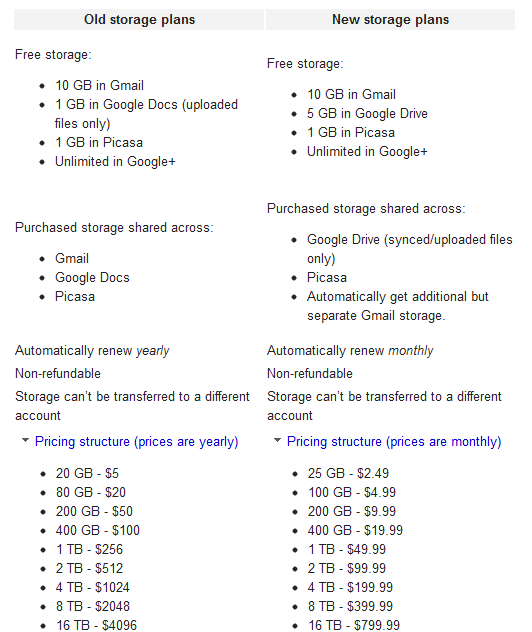 Gmail now offers 10 GB of free storage, while Google Drive only offers 5 GB. Instead of encouraging users to send attachments, the files could be stored in Google Drive. Google Drive integrates with third-party apps and one of them is already enabled by default: Pixlr, a photo editor. 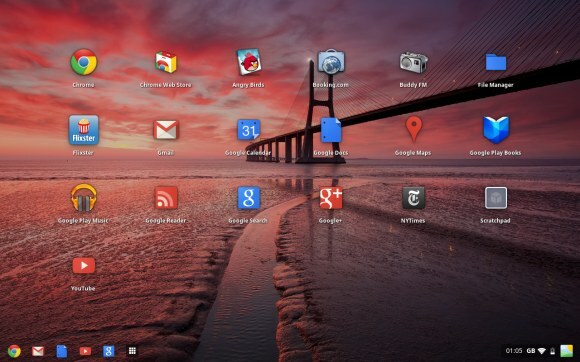 You can also install some Chrome apps that integrate with Google Drive. There's a new "open with" item that lets you pick one of the apps from the contextual menu. 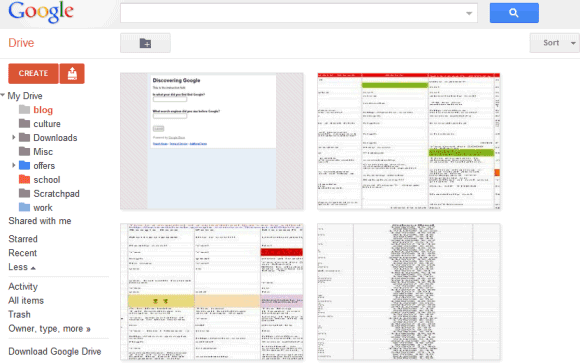 There are many other changes: a grid view, collections are now called folders, an activity view that shows "live updates of everything you and others have modified" and Google Apps support. "Drive is built to work seamlessly with your overall Google experience. You can attach photos from Drive to posts in Google+, and soon you'll be able to attach stuff from Drive directly to emails in Gmail. Drive is also an open platform, so we're working with many third-party developers so you can do things like send faxes, edit videos and create website mockups directly from Drive," explains Google. Ironically, the Google blog post is written by Sundar Pichai, who killed the Google Docs project back in 2008. "I don't think we need GDrive anymore. Files are so 1990," he said at that time. Google Play is not just for digital content. You can now buy unlocked Galaxy Nexus phones for only $399 if you are in the US. 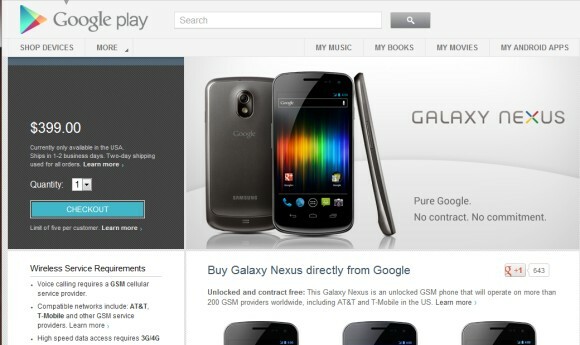 "Galaxy Nexus devices purchased on Google Play are unlocked GSM/HSPA+ devices. The unlocked Galaxy Nexus requires GSM compatible service provider for voice calling. In the United States this includes AT&T and T-Mobile," explains Google. "Galaxy Nexus costs $399 and arrives at your door unlocked, without a carrier commitment or contract. You can use it on the GSM network of your choice, including T-Mobile and AT&T. It also comes pre-installed with the Google Wallet app which lets you easily make purchases and redeem offers with a tap of your phone. Best of all, we'll give you a $10 credit to get you started with your new mobile wallet," mentions Andy Rubin. This is not Google's first attempt to create an online store for selling Android devices. Back in 2010, Google launched a web store that allowed you to buy a Nexus One and choose your favorite service provider. Google's goal was to add other Android devices and to make it easy to buy phones. Unfortunately, Google's store wasn't successful, people complained about the lack of customer service, Verizon skipped the Nexus One and Google closed the store four months later. "While the global adoption of the Android platform has exceeded our expectations, the web store has not. It's remained a niche channel for early adopters, but it's clear that many customers like a hands-on experience before buying a phone, and they also want a wide range of service plans to chose from," said Andy Rubin at that time. It's really difficult to sell unlocked phones in the US because they're a lot more expensive than the locked phones, plans cost the same and phones can't be used on two of the most important carriers: Verizon and Sprint. This time, things are a little different: Galaxy Nexus was only available for Verizon customers and its price dropped from $299 to $199. While $399 is not a high price for an unlocked phone launched 5 months ago, you can buy subsidized phones that are more powerful than Galaxy Nexus (for example, HTC One X for $199). Google's new store is better suited for tablets, since most people don't buy subsidized tablets. As the Wall Street Journal speculated last month, "Google will open its own online store this year, but stocked with tablets instead of phones. The Android tablets would be built by Samsung and ASUS who already offer the well received Galaxy Tab and Transformer lines, but have been unable to make a dent in marketshare comparable to that of Apple or even Amazon." 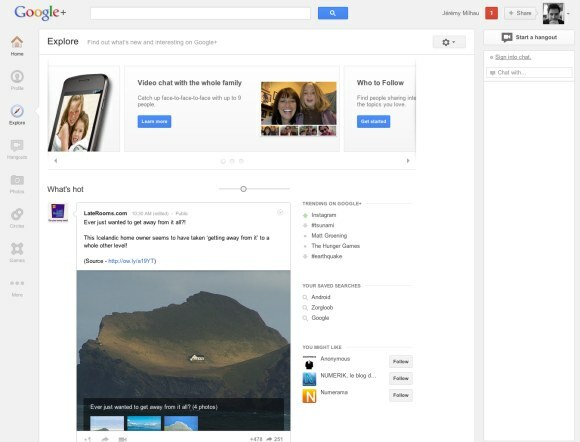 Google+ was built around sharing content and that's its main purpose, so many Google products started to provide a unified sharing experience powered by Google+. 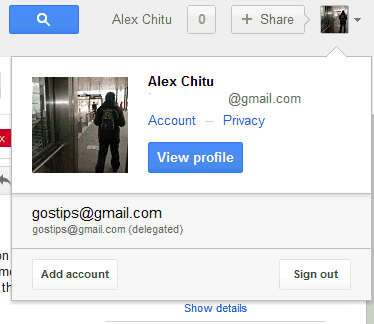 Gmail allows you to share image attachments with other Google+ users by clicking the "Share" link, but what about the embedded images from a message? Now you can share them by mousing over the images and clicking the "share" button. How to insert images into a Gmail message? Just drag and drop the images from your favorite file manager. It should work in the latest versions of Chrome, Safari and Firefox, assuming that you haven't disabled the rich text mode. Just because you add a YouTube video to a playlist doesn't mean you'll be able to watch it in the future. Many YouTube videos are removed because of copyright infringement, but some of them are deleted by the uploaders. YouTube now shows a warning at the top of the page when some of the videos from a playlist have been deleted from YouTube. The warning is only displayed when you open the playlist and there's also a button that lets you remove the videos that are no longer available. Unfortunately, YouTube no longer shows the title of a video after it's been deleted. 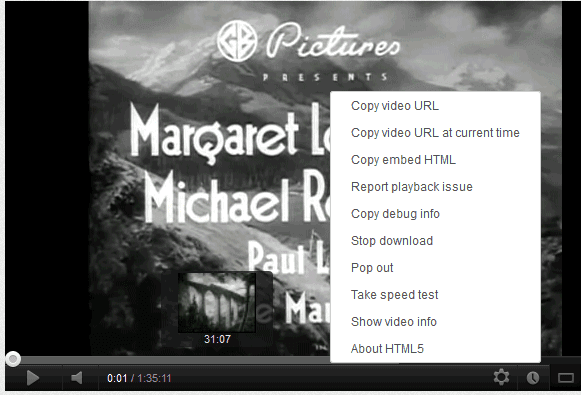 This was useful because you could find similar videos and add them to the playlist. 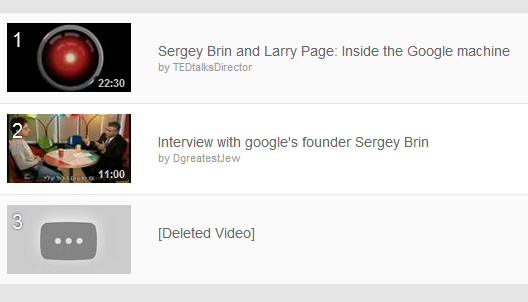 Now that YouTube replaces the title with "deleted video" and the video page only shows an error message, YouTube could automatically remove the missing videos. 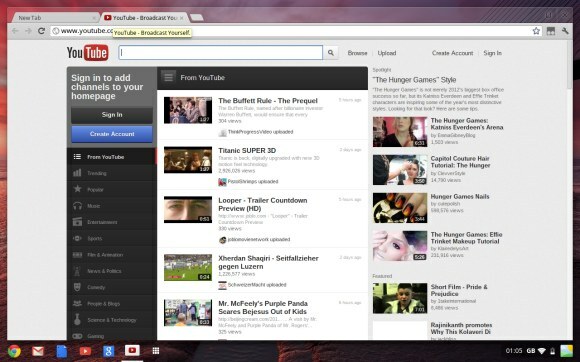 Back in 2010, YouTube started to test a feature that associated videos with topics. 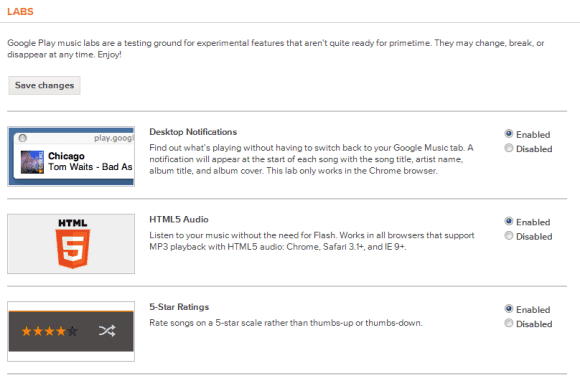 At that time, the experiment tried to improve search results pages by allowing you to find related videos. YouTube Topics is still available as a separate page that lists the most popular topics and lets you find topic channels like this one. There's also an experiment that shows the topic of a video next to the channel's name and lets you subscribe to the topic. The topic is an automatically generated channel. "We use many different sources to find these topics, including frequently used uploader keywords, common search queries, playlist names, and even sources outside of YouTube such as Wikipedia articles," explains YouTube's blog. Google's navigation bar widget that shows information about your account has been updated and now makes it easier to switch to a different account. All the accounts are automatically displayed, so you no longer have to click a link to see them. It's nice to see that Google went back to basics and removed the extra click. Multiple sign-in supports a lot of Google services, including Web Search, Google+, iGoogle and YouTube, so you don't need to use a different browser or the incognito window to sign in to another Google account. 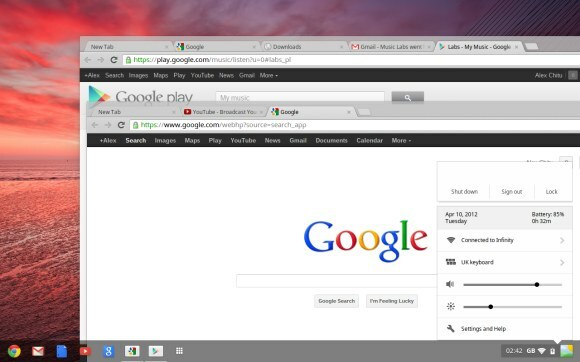 Chromebook users who install the latest Dev channel release of Chrome OS will be surprised to notice that Chrome OS looks more like a desktop operating system. 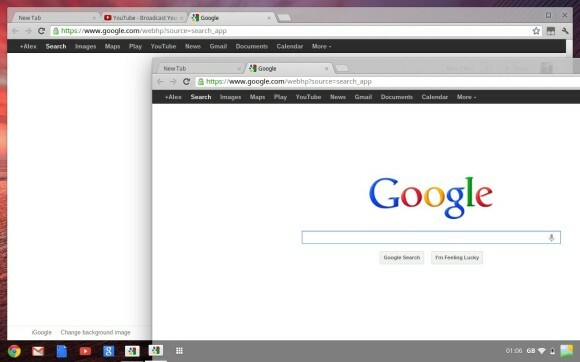 Google has been working on a new window manager called Aura that brings many features of a desktop OS. 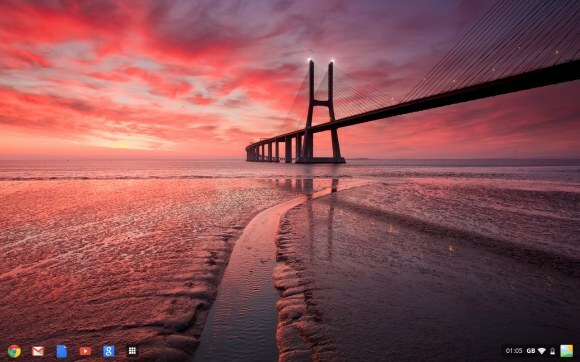 Chrome OS now has a desktop, a taskbar, apps are placed on the desktop, there's support for wallpapers and overlapping windows. According to Chrome's engineers, Aura is a hardware-accelerated "user interface framework for Chrome UI" that offers "rich visuals, large-scale animated transitions and effects that can be produced only with the assistance of hardware acceleration". Aura is cross-platform and should "provide the foundation of a flexible windowing system and shell for Chrome and ChromeOS on a variety of form factors". The latest Chrome OS release is only available for Samsung and Acer Chromebooks as Cr-48 Chromebooks will skip Chrome 19. After a few months of speculation, Google revealed some information about the project that will make Google Goggles and other mobile apps more useful. Instead of using a smartphone to find information about an object, translate a text, get directions, compare prices, you can use some smart glasses that augment the reality and help you understand more about that things around you. "We think technology should work for you—to be there when you need it and get out of your way when you don't. A group of us from Google[x] started Project Glass to build this kind of technology, one that helps you explore and share your world, putting you back in the moment," says Google. Google's concept glasses have a camera, a microphone and can connect to the Internet to send and receive data in real time. The interface is simple and it only shows relevant information. One of the people who used the glasses said that "they let technology get out of your way. If I want to take a picture I don't have to reach into my pocket and take out my phone; I just press a button at the top of the glasses and that's it." In February, New York Times reported that "the glasses [could] go on sale to the public by the end of the year. (...) The people familiar with the Google glasses said they would be Android-based, and will include a small screen that will sit a few inches from someone's eye. They will also have a 3G or 4G data connection and a number of sensors including motion and GPS." Seth Weintraub found that "the navigation system currently used is a head tilting-to scroll and click, (...) I/O on the glasses will also include voice input and output, and we are told the CPU/RAM/storage hardware is near the equivalent of a generation-old Android smartphone". 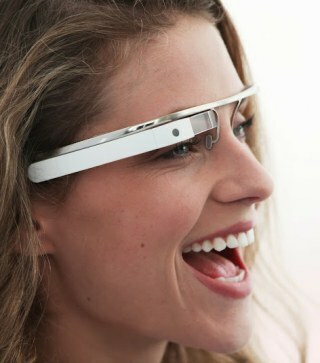 It will be interesting to see if Google will actually sell these smart glasses. There are a lot of issues that need to be solved before releasing a commercial product: from battery life to packaging so much technology in a such a small product, from improving Google Goggles to handling real-time video streaming. When an email message includes includes links to YouTube videos, Gmail shows a gadget that lets you watch the videos inside Gmail. 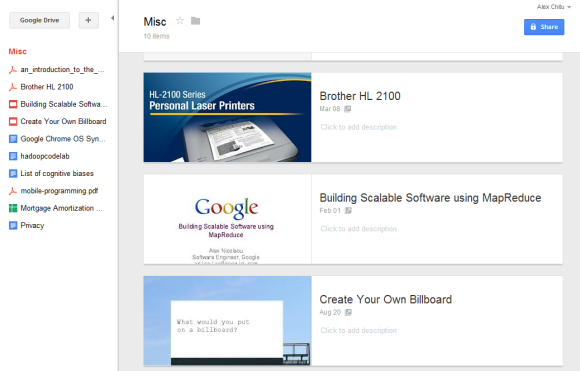 The YouTube preview feature graduated from Gmail Labs two years ago. 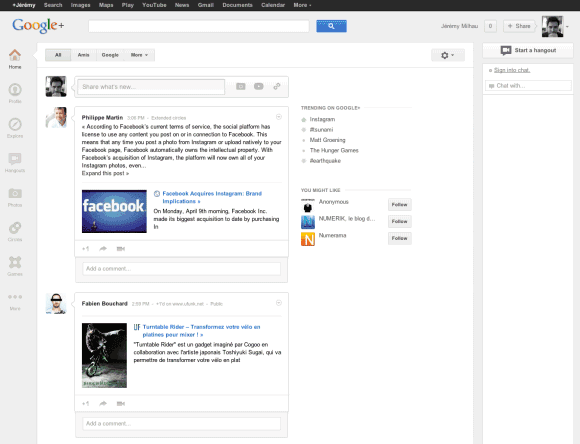 Gmail now tests another interface for previewing YouTube videos, but it only works for YouTube's email digests. When you click one of the thumbnails from the newsletter, Gmail shows the YouTube player in a "lightbox". For some reason, this only works when the "Apps Search" lab feature is enabled.